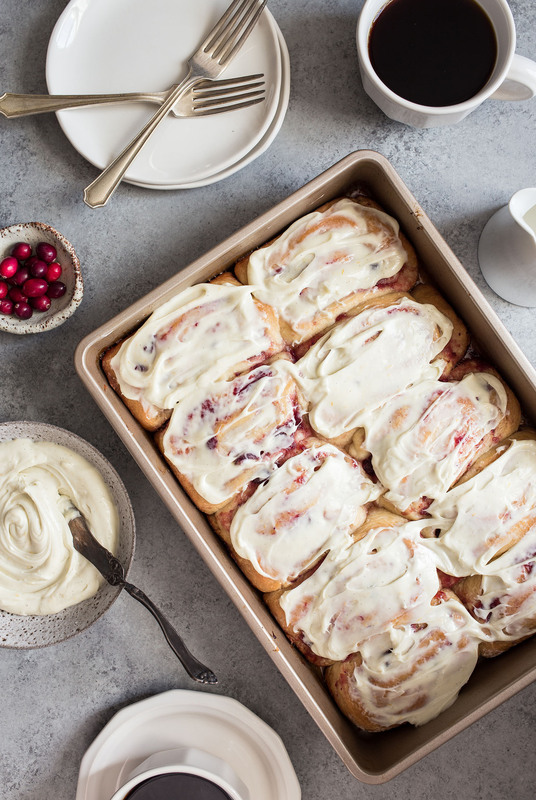 Cranberry and orange mingle between layers of soft, tender dough, creating the perfect morning treat. As if that weren’t enough, each roll gets a smear of white chocolate cream cheese frosting. In a large pot over medium-low heat, whisk together milk, sugar, and oil. Using a candy or instant-read thermometer, heat the milk mixture to 110°F. Remove pot from heat. Sprinkle the yeast over the top of the warm milk mixture, stir to dissolve. Mix in 3½ cups of flour. Cover the pot with a towel and allow to rest, undisturbed, for 1 hour. Add the salt, baking powder, and baking soda to the remaining 1 cup of flour; whisk together. Add to flour mixture in pot; stir until combined. Place the lid on the pot and refrigerate until the mixture is completely cool (the dough is easier to handle if it is refrigerated), at least 4 hours, preferably overnight. When ready to make the rolls: In a small bowl, add the cranberry sauce and orange zest. Whisk to combine. Butter a 9x13-inch baking pan, or two 9-inch pie plates or round cake pans. Starting at the long side furthest from you, roll the dough toward you, until it resembles a log. Pinch to seal. Turn the dough over so the seal faces the work surface. Slice off and discard each end. Slice the remaining log into 10 rolls, about 1½-2 inches thick each, and place in the prepared baking dish, cut side down. Cover the baking dish with a towel and allow to rise for 30 minutes. Place in the oven and bake for 20 minutes, or until the rolls are golden brown in color. Remove the rolls from the oven and allow to cool for 20 minutes. Recipe created for Red Star Yeast by One Sweet Mess. It appears to be out of sequence. You are indicating to butter the pans after cutting and rising. Thank you for your comment. The directions have been corrected. Looks like a new favorite. I can’t wait to try it.